How Much Should a Baby Weigh at 4 Months? In order to grow and develop properly, babies need to gain an appropriate amount of weight. Underweight and overweight babies are at risk for health problems, and abnormal growth may signal underlying health conditions. Infant weight guidelines and growth charts are available to help gauge if your baby's weight and growth pattern is on track, and how she compares with other infants. In the first year of life, a baby grows and develops at a rapid pace. The amount your baby should weigh at four months of age will vary depending on birth weight, length and gender. Longer babies are expected to weigh more and infant boys typically are heavier than baby girls the same age. Growth charts are used to track growth progress, and pediatricians typically look for consistency in growth rather than focusing on a number alone. The recommended weight for a baby four months old depends on their birth weight. The National Institutes of Health recommend a baby double their birth weight by 4- to 6-months of age. An infant who fails to double their weight by six months of age may need further evaluation by a pediatrician. The Centers for Disease Control and Prevention, or CDC, growth charts can help estimate infant weight expectations at different ages. 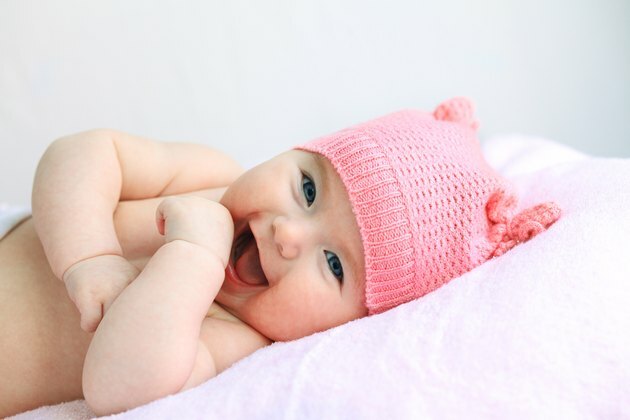 Pediatricians look for a consistent growth curve trend; for example a baby born at the 50th weight-for-age percentile is expected to remain at approximately the 50th percentile at four months of age, however babies will make slight deviations from the 50th percentile curve each month. A general trend is what pediatricians typically look for. CDC growth charts provide information regarding what most babies typically weigh at different ages. For example a baby at the 50th weight-for-age percentile is about average compared with other babies the same age and gender; 50 percent of other babies weigh more and 50 percent weigh less in comparison. Weight-for-length growth charts are also available and take into account a baby's length. According to the CDC growth charts the 50th weight-for-age percentile for a 4-month-old baby boy is approximately 15 Ibs., and for infant girls about 13.5 Ibs. Four-month-old babies who display short stature, underweight, overweight or at risk for overweight may require further evaluation or have an underlying health problem. The CDC lists criteria for conditions that indicate concerning growth patterns. These include short-stature as less than the 5th percentile length-for-age, underweight less than the 5th percentile weight-for-length, overweight as greater than the 95th percentile weight-for-length and at risk for overweight as 85th to 95th percentiles. Short-stature or underweight are possible indicators of malnutrition. Babies who fall into the overweight category have an increased risk for being overweight as adults according to the CDC. How Much Should a 14-Week-Old Baby Weigh?